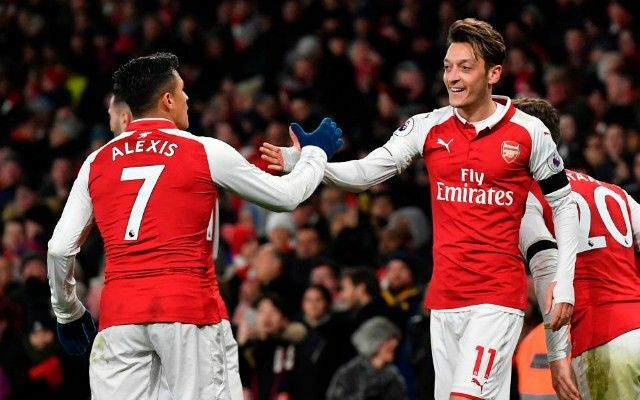 Mesut Ozil’s first-half wonder-goal gave Arsenal a 1-0 victory over Newcastle at the Emirates Stadium this afternoon to get back to winning ways in the Premier League. The Gunners flopped in midweek with a draw against struggling West Ham, but ground out the three points today against a resilient Newcastle side. While it wasn’t exactly a vintage display from Arsenal, Ozil ran the show from midfield with some fine passing and, of course, the superbly-taken winning goal in the first half. Adjusting his body perfectly, Ozil kept his eye on a dipping ball and guided it right back across the Newcastle goal with an inch-perfect volley. Manchester United fans may have loved it as they think the German is just trying to impress Jose Mourinho, but for now this kind of class is for Arsenal fans to enjoy. Oh dear, it was not a good afternoon for this man in front of goal. Alexandre Lacazette had a number of fine chances when put through on goal, but couldn’t make them count. One included a bizarre piece of decision making as he tried an audacious chip over the opposition ‘keeper when all he had to do was drill the ball past him. The Frenchman brings plenty to the side with his pace, but he looked a bit of a headless chicken today and it’s goals his club will want after paying what they did for him in the summer. Arsenal’s win against Newcastle today makes it ten in a row in the Premier League for the Gunners against the Magpies. Pretty decent. Wenger’s handling of Lacazette has been mostly idiotic.